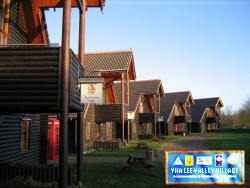 To see 2006 out and 2007 in we were based in the excellent Lee Valley Youth Hostel on the outskirts of Cheshunt, Hertfordshire. 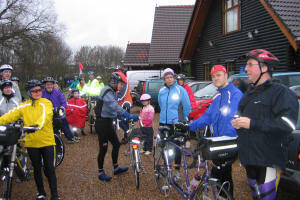 The Tandem Club had 2 of the 5 wooden lodges for its exclusive use, wherein the mixture of familes was happily accommodated. The very good breakfasts and dinners were taken in the central triple-lodge and entertainment was enjoyed in the fabulous upper level "barn like" room. A few of us took advantage of the suggested individual extension and arrived on Friday afternoon to enable us to get a full day's ride in on Saturday. A couple of loop routes and map had been made available to us by Edmonton Cycling Club and we duly used these to "do our own thing" on Saturday with the weather starting out sunny in the morning and only turning to rain as we arrived back at base - good timing - to find the car park very busy with new Tandem Club arrivals. 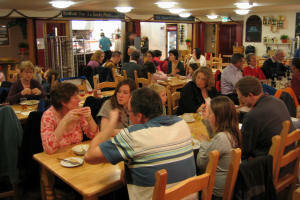 After our evening meal our host family entertained us with a very varied quiz to tax our brains. 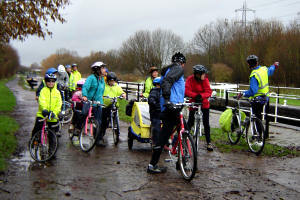 Sunday morning's weather didn't look at all promising but we all gathered, in a light drizzle, at the front of the hostel to be organised into the short ride and zoo group and the longer ride and pub group. Each group was led by members of the Edmonton Cycling Club who had generously offered to give their time and share their local knowledge. 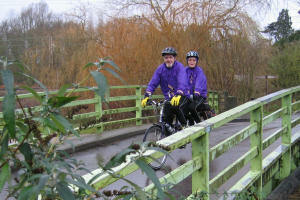 The short ride group went off in a southerly direction to explore some of the paths within the Lee Valley Country Park, past the Bittern Hide and the Royal Gunpowder Mills, then up to Broxbourne and so to the Paradise Park Zoo where white lions, white tigers, white leopards (they must specialise in unusual white cats!) 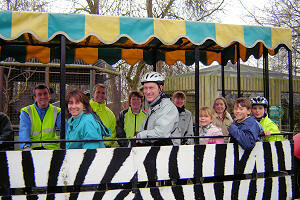 and all manner of other animals were seen from a train ride around the grounds. Back to the hostel through the Country Park via the very puddly and muddy towpath beside the River Lee Navigation which had many narrow-boats moored along it and lots of coots, geese and swans swimming along. 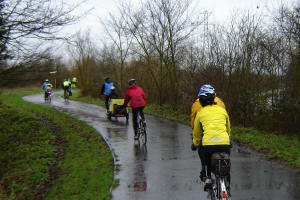 The long ride group stayed on the roads and so avoided getting quite as muddy as the other group. They went north out of Cheshunt and then used quiet country lanes up to Hertford with lunch at the Farmer's Boy pub in Brickendon. 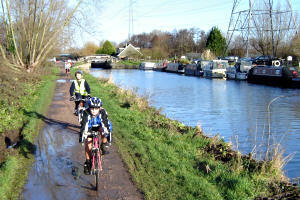 A third group headed in a northerly direction along the towpath to vist Ware. 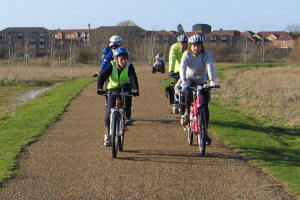 Amazingly the weather cleared up for us all very soon after we set off so a good day's cycling was enjoyed by everyone. We gathered for an early New Year dinner which was all very tasty, then repaired upstairs to be entertained by a 2006 quiz put on by the YH staff, followed by disco music to see the New Year in. After breakfast on New Year's Day we packed up but the YH staff had kindly said we could leave our vehicles there and use their facilities whilst we went out cycling or walking. As this was the best day of them all with a clear blue sky, though rather colder, several of us took advantage and explored the interesting area a little further. 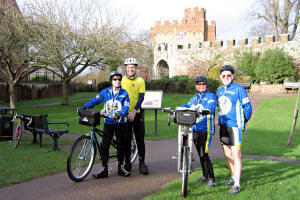 Our thanks to the Horne family for finding such a good venue where we were made very welcome and the cycling was varied and offered both road and track riding in a country environment.